Main aspects to consider prior to purchasing a mobile broadband deal, is the speed as well as the usage, right after the coverage of any service provider. When you refer to the speed of a mobile broadband connection, you chiefly mean the time taken to download or upload any data, like the web pages, music or video files, via the mobile broadband network. At the same time, the data usage limit specifies the amount of data, which you can download or use, specified under the tariff that you choose. Even now, the maximum speed of a mobile broadband connection is not still anywhere near that of the traditional permanent line ‘broadband’. You can see, below the specified speed of each network operator given in Mbps (megabits per second), as is claimed by them for their 3G network. Comparing the speed given by the mobile broadband service providers is not that easy, seeing as a few of them such as Three and Vodafone reports the usual expected speed, whilst other providers like Orange and T-Mobile provide the utmost or ‘up to’ speed. At the same time, the provider O2 is believed to have not made any claims via advertisements of its speed, so far. Three, in the meantime claims 0.6 to 1.8Mbps speed, while for Vodafone, the expected typical speed is 1 to 2Mbps. Orange, also claims up to 3.6Mbps and T-Mobile up to 7.2Mbps speed. We can also look at the download time taken at the expected speed. If the speed is 1Mbps, a track of the usual 4MB or megabyte can be downloaded in nearly half a minute and a film of about 1.5GB from maybe iTunes, could be downloaded in over three hours. Even if permanent broadband providers advertise speed, the mobile broadband providers, normally do not do so, for the reason that their speed could be varied as per the locality and situation, in comparison to fixed line connections. The speed would as well oscillate, broadly in the instance that you are using a mobile connection, while travelling. Depending on the user satisfaction on using the mobile broadband connections as well as reported instances states that the usual mobile broadband speed are much less than that claimed by the service providers. We can estimate that for a 3G mobile broadband connection, the predictable accurate connection speed could be 500Kbps. 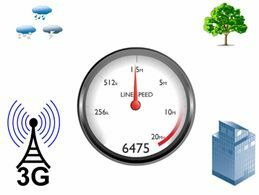 Let us as well have a look at some of the aspects that could influence the speed and coverage of your mobile broadband connections. 5) In case, the user is inside some building, then the 3G signals may find it difficult to reach within, thus reducing the coverage. In such instances, you may be required to move towards the window, in an attempt to increase the coverage. Speed of a mobile broadband is affected by certain aspects, which as well includes the type of mobile data signal offered by your service provider. If the 3G coverage in a certain area is nil, in that case, your connection will function as a normal GPRS connection. This second generation (2G) network is the most regularly used technology for providing internet access. However, the speed that it offers does not fall under mobile broadband speed. GPRS connection is used, mainly if you are not able to access a 3G signal. 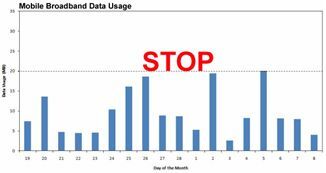 Other reasons are in case you have used up more than is allowed, as per your data usage. Then the service provider has the right to reduce the speed of the connection. The speed of your mobile broadband working on a GPRS connection is expected to be about 20 to 40Kbps, thus taking up to fifteen minutes to download a normal MP3 file. Right at the end of a 3G network is the EDGE, better known as the 2.5G claiming the speed of about 200Kbps. EDGE networks are less expensive to use, in comparison to 3G networks, and is commonly offered by the service providers as low- speed internet, to cater to the hole, as is caused by the quick 3G connections. 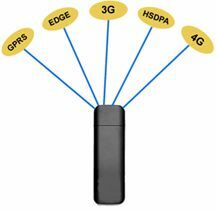 The third generation or 3G networks consist of wide-ranging network technologies such as the UMTS, HSDPA and the EDGE. All these networks normally provide the mobile broadband access at a much higher speed than that of a 2G network. HSDPA, known as 3G UMTS network is as well termed as 3.5G. HSDPA and is expected to be the highest mobile broadband speed as is offered in the UK, at 14Mbps (even if in actuality the speed maybe less). In terms of coverage, the HSDPA network is not that widespread as a regular 3G network. The next 4th generation or 4G network, is yet to arrive in the UK. In the meantime, a few of the US networks, as well as the networks in other areas declare that they have already launched a 4G network, functioning on the WiMax or the LTE. However, these are said to be more developed form of 3G and is no way caters to the needs of a 4G connections, as was specified by the International Telecommunications Union. It is believed that LTE Advanced is as well on the look out to launch the first ever 4G network in the UK. Known as the advancement of UMTS network, this connection as per the analysis done in Japan, claims at the most a download speed of 5GB, under the ideal conditions. Downloading data via the mobile broadband costs definitely more, be it per MB or even GB, in comparison to using a permanent line broadband. Hence, in case, you access a lot of data, such as play online games or stream and download videos and TV, then you should go for a permanent line broadband. At the same time, if you do not use too much of internet and is just using the net to browse through the websites or only to check emails and maybe to download some light music files, then the usage limit specified by the mobile broadband providers should not be much of an issue for you. See here, below three usual data usage limits that is chiefly used by mobile broadband providers with regards to web browsing, mp3 or video downloads, checking emails and as is measured with the which? Broadband Calculator. 500MB includes approximately browsing the internet for about six hours in seven days, reading and replying to about 33 emails a week, as well as updating two software per week. 1GB usage estimates to about 10 hours a week of browsing the internet, sending and receiving about 50 emails per week; updates of four software every month; downloading and uploading 10 photos, downloading 5 short videos and five music tracks for the month. Usage limit of 2GB means 20 hours of web browsing for the seven days, sending and receiving 50 emails for every week, updating four software for the month, downloading or uploading 10 photos every month, downloading 10 short videos and 15 music tracks per month. In general, all service providers has to email or text the user to warn in case they are using up more than the data limit, that is set for them. Each service provider comes up with varied punishment, in case of exceeding data usage limits. Hence, make sure of the policy at the outset. • In case of exceeding data usage limit, the provider has the right to terminate the connection, even if such a step is rarely taken and is the norm for those frequent offenders who continuously go beyond the data usage limit. • A few of the operators may opt to cut back on the speed. Most of the service providers like the T-Mobile and Vodafone may bring down the connection to the 2G network, if the user surpasses the usage limit. • Some of the providers including Orange and O2 will charge extra 5p and 2p, respectively, for each additional MB used up. • Some may even terminate the access to Wi-Fi hotspots, which was offered initially as a package, in case of going beyond the data usage limit. • Browse through the details on the hidden fees of the mobile broadband, to get an idea about the out of tariff charges. The tariffs for the mobile broadband are not usually promoted as “unlimited”, seeing as the data allowances normally have fair usage policies. The service provider T-Mobile in the meantime, with its fair usage policy of 3GB specified on its unlimited broadband charge per month. Even if T-Mobile does not ask for any extra charge on going beyond the usage limit, the speed definitely is curbed.